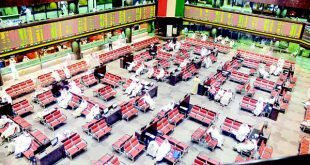 KUWAIT CITY, March 8: Kuwait stocks pulled higher on Tuesday as it extended its volatile course. The bourse, after a soggy start, climbed 19.97 points to 5,284.68 points led by strong gains is select counters. Some of the banks too eked modest gains even as oil prices continued to trend higher. The KSX 15 measure ticked 1.82 pts higher to 860.99 points taking the month’s gains to 38 points while weighted index was up 1.2 points at 365.33 pts. The volume turnover meanwhile slipped below the 200 million after holding above the mark in last two sessions. 176.89 million shares changed hands — a 17.9 percent drop from the day before. The sectors closed mostly in green turf. Healthcare outshone the rest with 2.90 percent gain whereas consumer services shed 0.44 pct, the worst performer of the day. In terms of volume, financial services dominated with 42.9 pct market share and real estate stood next with 26.6 percent. Consumer services was a distant third with 5.35 pct contribution. Among the notable movers, Kuwait Food Co (Americana) extended its strong winning spree with 100 fils jump to KD 2.420 while Kuwait Portland Cement climbed 20 fils to KD 1.040. Mabanee Co rose 10 fils to KD 0.870 trimming the month’s losses to 20 fils. Telecom heavyweight Zain was unchanged at KD 0.375 after trading 2.17 million shares whereas Wataniya Telecom (Ooredoo) swung 40 fils higher. Kuwait Telecommunications Co (VIVA) rose 10 fils to KD 0.980 and logistics major Agility gave up 5 fils to wind up at KD 0.455. Investment conglomerate KIPCO was flat at KD 0.560 after trading 1.2 million shares while National Investments Company added 3 fils. The company has incurred a net loss of KD 5.57 million and losses per share of 7 fils in the year 2015 as against net profit of KD 6.67 mln and earnings per share 8 fils in the same period last year. The market opened flat and moved sideways in early trade. The price index slipped slightly into red to hit the day’s lowest level of 5255.43 pts amid moderate bout of selling in select counters. It however clawed back in the final minutes to close with modest gains. Top gainer of the day, Metal and Recycling Co climbed 8.77pct to 62 fils while Safwan Trading Co rose 8.62 percent to stand close behind. Marakez slid 7.94 percent, the steepest decliner of the day and Sokouk Holding topped the volume with 11.7 million shares. Mirroring the day’s upswing, the market spread was skewed towards the winners. 56 stocks advanced whereas 30 closed lower. Of the 133 counters active on Tuesday, 47 closed flat. 3854 deals worth KD 12.14 million were transacted — a 15.8 pct drop in value from the day before. National Industries Group was flat at 118 fils and RISCO too did not budge from its earlier close of 320 fils. Gulf Cable climbed 10 fils to KD 0.360 whereas ACICO Industries slipped 5 fils to 420 fils. Jazeera Airways was unchanged at KD 0.840 and ALAFCO followed suit. The company has posted net profit of KD 3.01 million and earnings per share of 3.68 fils in the first quarter ended on 31 December 2015 as compared to net profit of KD 4.32 million and earnings per share of 5.28 fils in the same period last year. Kuwait and Gulf Link Transport Co inched 0.5 fils higher while KGL Logistics held steady at 65 fils. Zima Holding gave up 5 fils to settle at 74 fils and Al Nawadi Holding Co clipped 4 fils. IFA Hotels and Resorts gained 10 fils with thin trading and Yiaco Medical Co followed suit. Mezzan Holding Co stood pat at KD 1.040 and Equipment Holding Co inched 1 fils lower. Jeeran Holding was unchanged at 69 fils. In the banking sector, National Bank of Kuwait was flat at KD 0.740 off early lows after trading over 1 million shares whereas Gulf Bank gave up 2 fils to end at 218 fils. Al Ahli Bank climbed 10 fils to 360 fils. Ahli United Bank rose 5 fils to KD 0.450 and Kuwait International Bank took in 2 fils. Burgan Bank stood pat at KD 0.345 whereas Kuwait Finance House was down 10 fils at KD 0.500 with a volume of 1.6 million shares. Boubyan bank rose 5 fils to KD 0.415 and Warba Bank nudged 2 fils higher. Commercial Bank of Kuwait was not traded during the session. Securities House Co inched 1 fil up on back of 11.3 million shares and Securities Group Co paused at 82 fils. Gulf Investment Co and Sokouk Holding Co eased 1 fil each whereas Bayan Investment Co closed 1 fils in green. Warba Insurance Co fell 2 fils to 110 fils. KFIC clipped 2 fils and Al Mal Investmeent rose 1.5 fils on back of 7.8 million shares. Al Deera Holding was unchanged at 30 fils. Salhia Real Estate Co slipped 5 fils to 355 fils whereas Mazaya Holding Co stood pat at KD 0.870. National Real Estate Co inched 1 fil higher on back over 1 million shares. The market was been largely upbeat so far during the week and has climbed 40 points in last three sessions. It had rallied 78 pts so far during the month and is trading 5.88 pct lower year-to-date. KSE, with 213 listed companies, is the second largest bourse in the region. In the bourse related news, Credit Rating and Collection Co has incurred a net loss of KD 454,911 and losses per share of 2.76 fils in 2015 as against net loss of KD 2.26 million and losses per share of 13.73 fils in the year before. INOVEST has incurred a net loss of KD 14.37 million and loss per share of 50.48 fils in 2015 as compared to net loss of KD 1.149 million and loss per share of 4.03 fils in the year before. Injazzat Real Estate Development Company has clocked a net profit KD 3.07 million and earnings per share of 9.2 fils in 2015, rising sharply from net profit of KD 1.51 mln and earnings per share of 4.5 fils in the same period last year. The BOD has recommended 5 pct cash dividends. Kuwait Insurance Company has logged a net profit of KD 5.69 million and earnings per share of 30.69 fils in the year ending Dec 31, 2015 up from net profit of KD 5.14 million and earnings per share of 27.64 fils in 2014. The BOD has recommended 20 pct cash dividends. Aqar Real Estate Investments Co. has registered a net profit of KD 2.49 million and earnings per share of 11.07 fils during 2015 as against net profit of KD 2.24 million and earnings per share of 9.81 fils in the year before. Board of Directors recommended 6% cash dividends.